Le French Book (NY), 9781939474049, 149pp. In another Epicurean journey in France, renowned wine critic Benjamin Cooker's world gets turned upside down one night in Paris. He retreats to the region around Tours to recover. There a flamboyant British dandy, a spectacular blue-eyed blond, a zealous concierge and touchy local police disturb his well-deserved rest. 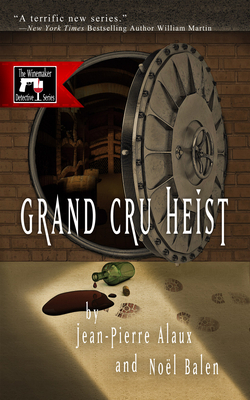 From the Loire Valley to Bordeaux, in between a glass of Vouvray and a bottle of Saint-Emilion, the Winemaker Detective and his assistant Virgile turn PI to solve two murders and very particular heist. Who stole those bottles of grand cru classe? Jean-Pierre Alaux is a magazine, radio and television journalist when he is not writing novels in southwestern France. He is a genuine wine and food lover, and won the Antonin Careme prize for his cookbook "La Truffe sur le Souffle," which he wrote with the chef Alexis Pelissou. He is the grandson of a winemaker and exhibits a real passion for wine and winemaking. For him, there is no greater common denominator than wine. Coauthor of the Winemaker Detective series, Noel Balen lives in Paris, where he shares his time between writing, making records, and lecturing on music. He plays bass, is a music critic and has authored a number of books about musicians in addition to his novel and short-story writing. Anne Trager has lived in France for over a quarter of a century, working in translation, publishing and communications. In 2011, she woke up one morning and said, I just can t stand it anymore. There are way too many good books being written in France not reaching a broader audience. That s when she founded Le French Book to translate some of those books into English. The company s motto is If we love it, we translate it, and Anne loves crime fiction, mysteries and detective novels--and wine.